With the Republican party assuming control of the House of Representatives, Nancy Pelosi has been demoted, and she may run for House Minority Leader, but she may not have an easy time - North Carolina Rep. Heath Shuler plans on running for that position. 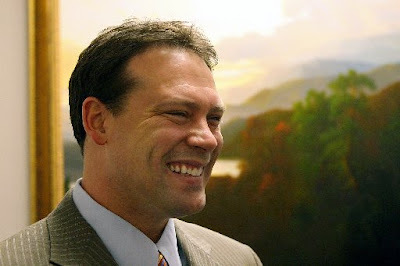 Nancy Pelosi's demotion from Speaker of the House could end up being a few more steps down if Rep. Heath Shuler (D-N.C.) has his way, as reports now suggest that the Blue Dog Democrat will challenge her for the House minority leader position. "If there's not a viable alternative [to Pelosi] -- like I said all along -- I can go recruit moderate Members to run in swing districts," Shuler said on Thursday. "In that situation, I could do it better than she could, and that's what it's going to take. It's going to take moderate candidates to win back those seats." Pelosi has not said whether she will pursue the leadership post. Shuler announced his intention to challenge Pelosi late last month during a debate with his opponent, Jeff Miller, whom he defeated on Tuesday. "If there is no viable alternative (to Pelosi), I will be running for speaker of the house," Shuler said during that exchange. The top House spot in the Democratic party will now be minority leader following the shift of power. I agree with Shuler. While my opinion about Nancy Pelosi leaned more towards indifferent, and even considering the fact that as House Majority Leader Pelosi had a lot of legislative accomplishments, I think that that it would be a time for a change, and moving more towards the center by electing a moderate would be beneficial and politicallly succesful. Conservatives have spent years demonizing Pelosi, and when the Blue Dog Democrats - called DINOs by some - bucked party leadership, Republicans somewhat praised their actions, so to have a moderate in charge would make things a bit more difficult for the GOP, although I highly doubt that would stop their propaganda machines. Pelosi had made some comments regarding the election that I thought were interesting. "The election was no ringing endorsement of Republicans," she said. "We do not accept their version of what this election means. It's not about rejecting what President Obama has done. It didn't go fast enough to create jobs. That's what it's about." While I agree with her statement, this year's elections proved interesting - majority of ultra-conservatives lost at the polls, but so had liberal candidates who were branded by the conservative media as being too liberal. Moderates like Shuler were able to win their seat, and consider the Senate race in Florida - while Marco Rubio won 49 percent of the vote, moderate Governor Charlie Crist grabbed an impressive 30 percent and Democrat Kendrick Meek picked up 20 percent. The liberal and moderate votes add up to more then the conservative's, and considering the amount of money flowing into the elections that propped up Rubio's campaign, Democrats would have greater electoral success supporting the Blue Dogs. Winning at the polls also means protecting their past successes like health care reform - something Republicans have been aiming to dismantle since before it was even signed into law.